The 73-year-old from Nanchang City caught the H10N8 virus after visiting a live poultry market, although it is not known for sure if this was the source of infection. A second person has since become infected in China's Jiangxi province. Scientists told The Lancet the potential for it to become a pandemic "should not be underestimated". This particular strain of influenza A virus has not been seen before. In recent months, China has already been coping with an outbreak of a similar influenza virus called H7N9, which has killed around a quarter of those infected. 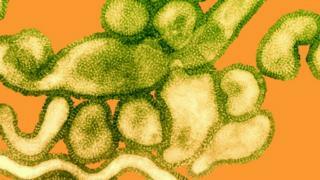 Scientists who have studied the new H10N8 virus say it has evolved some genetic characteristics that may allow it to replicate efficiently in humans. The concern is that it could ultimately be able to spread from person to person, although experts stress that there is no evidence of this yet. Dr Linda Klavinskis, senior lecturer in immunobiology at King's College London, said there was no immediate threat. New bird flu: How bad is H10N8? Dr John McCauley, director of the WHO[World Health Organization] Collaborating Centre for Influenza, MRC [Medical Research Council] National Institute for Medical Research, said: "The potential epidemiological significance of this zoonotic infection is not clear. Avian influenza viruses of the sub-type H10N8 are probably not particularly unusual. Whether there were complications in this case is unclear. "This case reminds us to be aware of human infections from animal influenza viruses, like the H7N9 cases in China which increase daily. Previously we did not think that H7N9 infections might be so lethal. Now we also must consider H10N8 infections as well." Dr Jeremy Farrar, director of the Wellcome Trust, said: "We should always be worried when viruses cross the species barrier from birds or animals to humans as it is very unlikely that we will have prior immunity to protect us.